The School brings together over 100 academics dedicated to investigating and learning with and about the people, languages, and land of Asia and the Pacific region. Their work, conducted in collaboration with partners throughout the world and the region, contributes uniquely Australian perspectives and insights. The School hosts ANU’s centre for Japanese language and cultural learning, the Japan Centre, as well as many scholars working on Japan. The School is dedicated to advancing analysis and understanding of the international, political, societal, and strategic affairs of Asia and the Pacific. It is also home to a number of specialists whose focus centres on or relates to the Japan field. The Australia-Japan Research Centre conducts research to explore and improve understanding of the economies and economic policy processes in Australia and Japan and both countries’ strategic interests in the Asia Pacific economy. Its policy-oriented areas of interest cover developments in regional economic cooperation and integration and encompass research on trade, finance, macroeconomics and structural and regulatory reform, as well as international economic relations. RegNet is an internationally acclaimed interdisciplinary program that serves as the central node for a network of centres, projects, institutions, practitioners and academics involved in exploring and understanding critical domains of regulation. Our mission is regulatory research at the highest international standards that makes local contributions to good governance. RegNet scholars with a focus on Japan include Peter Grabosky (crime and regulation); Veronica Taylor (legal technical assistance and development); Hiroko Inoue (peace building in Timor Leste). RegNet’s institutional links with Japan include an annual Visiting Fellow from Japan’s National Police Agency. The East Asian Bureau of Economic Research is a forum for high-quality economic research focussing on issues facing the economies of East Asia. It comprises representatives from Japan, China, South Korea, Vietnam, Cambodia, Laos, Thailand, Malaysia, the Philippines, Indonesia and Australia. The ANU College of Law is one of Australia’s leading law schools. With particular strengths in international law and public law, the College holds not only a commitment to excellence in teaching and research, but one to the continuous improvement of the law and the operation of the legal system. The ANU College of Law is also a founding member of the Australian Network for Japanese Law (ANJeL). The ANU School of Art (SoA) prepares students for professional careers in visual arts, media arts and design. The School has long standing connection to Japan through its exchange program with Kyoto Seika University, regular study tours to Japan and its artist-in-residence program which has brought a number of Japanese artists to the School. The Australian Network for Japanese Law (ANJeL) is an initiative of the law faculties at the Australian National University, the University of New South Wales and the University of Sydney. With a network around the world of over 350 scholars, practitioners, policy-makers, senior students and others interested in Japanese Law, its core aim is to promote scholarly engagement with Japanese law, especially in Australia. See the team profile here. The Australian Research Network on the Japanese Economy (ARNJE) aims to promote research on the Japanese economy. Beginning as a researchers based network in Australia, with scope to expand to Asia and the Pacific, ARNJE links specialists by creating a forum for the discussion of research work and by providing venues and opportunities for conferences and workshops. 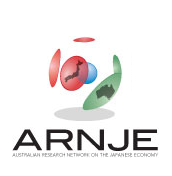 ARNJE is currently a network of over 60 Australian-based scholars who have interests in the Japanese economy.